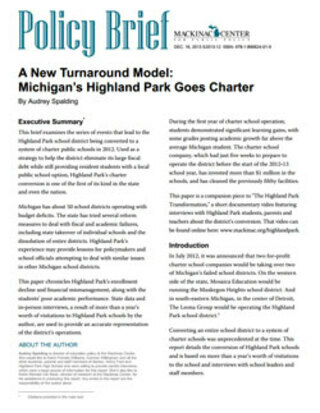 1 “Highland Park Public Schools Selects Leona Group to Manage Charter System” (Michigan Radio, July 27, 2012), accessed Dec. 5, 2013, http://goo.gl/GUv3OL. 2 Brian Smith, “See the 56 Michigan School Districts with Budget Deficits,” MLive.com, Sep. 12, 2013, accessed Dec. 11, 2013, http://goo.gl/2Dj6oB. 3 Tracy Samilton, “Districts Surrounding Dissolved Inkster, Buena Vista, Prepare for Influx of Students” (Michigan Radio, July 13, 2013), accessed Dec. 6, 2013, http://goo.gl/4NfBru; Aaron Foley, “EAA Set to Take over Six Detroit High Schools, Nine Elementary-Middle Schools,” MLive.com, Mar. 13, 2012, accessed Dec. 11, 2013, http://goo.gl/q5xRzK. 4 Author’s calculations based on “Bulletin 1014 - Michigan Public Schools Ranked by Select Financial Information” (Michigan Department of Education, 2013), accessed Dec. 6, 2013, http://goo.gl/kcxTC8. 6 Author’s calculations based on Center for Educational Performance and Information, “CEPI Nonresident Cub File” (Center for Educational Performance and Information); “Bulletin 1014 - Michigan Public Schools Ranked by Select Financial Information” (Michigan Department of Education, 2013), accessed Dec. 6, 2013, http://goo.gl/kcxTC8. 7 “Non-Resident Student Research Tool” (Center for Educational Performance and Information, 2013), accessed Dec. 6, 2013, http://goo.gl/heEOeN; Michael Winerip, “For Detroit Schools, Mixed Picture on Reforms,” New York Times, Mar. 13, 2011, accessed Dec. 6, 2013, http://goo.gl/PAKY9. 8 “Bulletin 1014 - Michigan Public Schools Ranked by Select Financial Information” (Michigan Department of Education, 2013), accessed Dec. 6, 2013, http://goo.gl/kcxTC8. 9 “Non-Resident Student Research Tool” (Center for Educational Performance and Information, 2013), accessed Dec. 6, 2013, http://goo.gl/heEOeN; “Bulletin 1014 - Michigan Public Schools Ranked by Select Financial Information” (Michigan Department of Education, 2013), accessed Dec. 6, 2013, http://goo.gl/kcxTC8. 10 “Michigan School District Revenue and Expenditure Report” (Mackinac Center for Public Policy, 2013), accessed Oct. 23, 2013, http://goo.gl/Dp2iRA. 11 Author’s calculations based on Ibid. 13 Author’s calculations based on Ibid. 14 “Bulletin 1014 - Michigan Public Schools Ranked by Select Financial Information” (Michigan Department of Education, 2013), accessed Dec. 6, 2013, http://goo.gl/kcxTC8; “Michigan School District Revenue and Expenditure Report” (Mackinac Center for Public Policy, 2013), accessed Oct. 23, 2013, http://goo.gl/Dp2iRA. 15 This figure is based on “current expenditures” and “average daily attendance” as reported in National Public Education Financial Survey. “Michigan School District Revenue and Expenditure Report” (Mackinac Center for Public Policy, 2013), accessed Oct. 23, 2013, http://goo.gl/Dp2iRA. 16 U.S. Attorney’s Office, “Highland Park School Board Member Indicted on Theft Charges”, 2012, http://goo.gl/xW9JER. 17 “Highland Park School Board Member Will Face a Judge on Contempt Charges” (WXYZ, Aug. 10, 2013), accessed Dec. 6, 2013, http://goo.gl/Vcpax6. 18 Patricia Ashford, Interview with Audrey Spalding, May 7, 2013. 19 Audrey Spalding, “The Highland Park Transformation,” (Mackinac Center for Public Policy, Nov. 19, 2013), www.mackinac.org/ highlandpark. Interviews with Highland Park high school students conducted on May 7, 2013. 20 S.S. et al v. State of Michigan et al. (American Civil Liberties Union, Aug. 8, 2012), accessed Dec. 6, 2013, http://goo.gl/I5wHeJ. 21 Audrey Spalding, “The Highland Park Transformation,” (Mackinac Center for Public Policy, Nov. 19, 2013), www.mackinac.org/ highlandpark. 22 “MEAP Downloadable Data Files: Fall 2011 MEAP Four Year Comparison (Gap Analysis)” (Michigan Department of Education), accessed Dec. 6, 2013, http://goo.gl/RlHHgw. 25 Tracy Samilton, “Districts Surrounding Dissolved Inkster, Buena Vista, Prepare for Influx of Students” (Michigan Radio, July 13, 2013), accessed Dec. 6, 2013, http://goo.gl/4NfBru. 26 “MEAP Downloadable Data Files: Fall 2011 MEAP Four Year Comparison (Gap Analysis)” (Michigan Department of Education), accessed Dec. 6, 2013, http://goo.gl/RlHHgw. 27 “Spring 2009 - 2012 MME Four Year Demographic Gap Analysis” (Michigan Department of Education), accessed Dec. 6, 2013, http://goo.gl/PPcE2. 29 Robert Bovitz et al., “Report of the Highland Park School District Financial Review Team” (Michigan Department of Treasury, Jan. 3, 2012), accessed Dec. 5, 2013, http://goo.gl/jrxE72. 30 “Governor Snyder Determines ‘Financial Emergency’ in Highland Park Schools” (Office of the Governor, Jan. 12, 2012), accessed Dec. 5, 2013, http://goo.gl/Cw3W4k. 31 Lori Higgins, “State Gives Highland Park Schools a $188,000 Advance to Cover Payroll,” Detroit Free Press, Jan. 12, 2012, accessed Dec. 5, 2013, http://goo.gl/2KhnHD. 32 “Jack Martin Reappointed as Emergency Manager for Highland Park Schools” (Michigan Executive Office, Mar. 2, 2012), accessed Dec. 5, 2013, http://goo.gl/r7zhst. 33 “Snyder, Lawmakers Partner to Give Highland Park Students Options” (Office of the Governor, Feb. 24, 2012), accessed Dec. 6, 2013, http://goo.gl/iK81o1. 34 The Associated Press, “Ruling Puts Michigan’s Highland Park Schools Emergency Manager in Limbo” (Michigan Radio, Feb. 15, 2012), accessed Dec. 5, 2013, http://goo.gl/HRre7F; “Snyder Appoints Parker as Successor-Emergency Manager for Highland Park Schools” (Michigan Department of Treasury, May 10, 2012), accessed Dec. 5, 2013, http://goo.gl/c7Kfnx. 35 “Emergency Manager” (Office of the Governor, 1990), accessed Dec. 6, 2013, http://goo.gl/60LhXB. 36 Joyce Parker, “Order 2012-1” (School District of the City of Highland Park, June 8, 2012), accessed Dec. 5, 2013, http://goo.gl/w2RhdP; Dylan Scott, “Michigan Emergency Managers Outsource Education,” Governing, Aug. 2, 2012, accessed Dec. 11, 2013, http://goo.gl/R6pajs; “Emergency Manager” (Michigan Office of the Governor, 1990), accessed Dec. 6, 2013, http://goo.gl/cTKigW. 37 Dave Murray, “Emergency Manager Recommends Highland Park Become a Charter School District, as State Educators Fear Plan Will Spread to Others,” MLive.com, June 18, 2012, accessed Dec. 5, 2013, http://goo.gl/q9y5FO. 38 Joyce Parker, “Financial Plan for the School District of the City of Highland Park” (School District of the City of Highland Park, June 20, 2013), accessed Dec. 6, 2013, http://goo.gl/ycLgJn. 41 Brian Smith, “Charter School Operator Leona Group Fires Back over Education Trust-Midwest Report Criticizing Its Effectiveness,” MLive.com, May 25, 2013, accessed Dec. 6, 2013, http://goo.gl/KH0QAC. Dr. Bill Coats, CEO of The Leona Group, Interview with Audrey Spalding, Jan. 23, 2013. 42 “Highland Park Students File Class-Action ‘Right to Read’ Lawsuit” (American Civil Liberties Union, July 12, 2012), accessed Dec. 5, 2013, http://goo.gl/pVb9Hr. 43 Tom Gantert, “Charter School Results Proving ACLU Lawsuit Wrong,” Michigan Capitol Confidential (Mackinac Center for Public Policy, Aug. 20, 2013), accessed Dec. 11, 2013, http://goo.gl/DBWajx. 44 Highland Park Renaissance Academy Superintendent Pamela Williams, Interview with Audrey Spalding, July 24, 2013. 45 Tammy Stables Battaglia, “Protests Erupt, Highland Park Board Member Resigns over Discarded History Books,” Detroit Free Press, July 8, 2013, accessed Dec. 6, 2013, http://goo.gl/NdVm8h. 46 Highland Park Renaissance Academy Superintendent Pamela Williams and Henry Ford School Leader Thomas Goodley, Interview with Audrey Spalding, July 24, 2013. 47 Highland Park Renaissance Academy Superintendent Pamela Williams, Interview with Audrey Spalding, July 24, 2013. 48 “MI School Data: Student Count Snapshot” (Michigan Department of Education, 2013), accessed Dec. 12, 2013, http://goo.gl/5pLL6c. 49 Student interviews conducted by Audrey Spalding between December 2012 and May 2013. 50 Patricia Ashford and Valecia Ashford, Interviews with Audrey Spalding, May 3, 2013 and May 7, 2013. 51 Madalyn Kaltz, “The Leona Group Will Revitalize Highland Park Schools” (The Leona Group, July 17, 2013). 53 “Inter-Quartile Range for Growth Trajectories: Mathematics Michigan” (Scantron Corporation, 2005); “Inter-Quartile Range for Growth Trajectories: Reading Michigan” (Scantron Corporation, 2005); “Diagnostic Test Reports” (Scantron Corporation, Aug. 7, 2013). 54 “Diagnostic Test Reports” (Scantron Corporation, Aug. 7, 2013). Ninth-graders failed to post statistically significant gains in reading. 55 Robert Bovitz et al., “Report of the Highland Park School District Financial Review Team” (Michigan Department of Treasury, Jan. 3, 2012), accessed Dec. 5, 2013, http://goo.gl/jrxE72. 56 “Governor Snyder Determines ‘Financial Emergency’ in Highland Park Schools” (Office of the Governor, Jan. 12, 2012), accessed Dec. 5, 2013, http://goo.gl/Cw3W4k. 57 Lori Higgins, “State Gives Highland Park Schools a $188,000 Advance to Cover Payroll,” Detroit Free Press, Jan. 12, 2012, accessed Dec. 5, 2013, http://goo.gl/2KhnHD. 58 Aaron Foley, “Gov. Snyder Appoints Jack Martin as Emergency Manager for Highland Park Schools,” MLive.com, Jan. 27, 2012, accessed Dec. 5, 2013, http://goo.gl/N6maO8. 59 “Jack Martin Reappointed as Emergency Manager for Highland Park Schools” (Michigan Executive Office, Mar. 2, 2012), accessed Dec. 5, 2013, http://goo.gl/r7zhst. 61 Dawson Bell and Bill Laitner, “Gov. Rick Snyder: Highland Park School District Faces Shutdown Without Intervention,” Detroit Free Press, Feb. 22, 2012, accessed Dec. 5, 2013, http://goo.gl/NhFgcT. 62 Rick Snyder, “Letter to Highland Park Superintendent and Board of Education” (Michigan Executive Office, Feb. 23, 2012), accessed Dec. 5, 2013, http://goo.gl/vmg96P. 63 “Jack Martin Reappointed as Emergency Manager for Highland Park Schools” (Michigan Executive Office, Mar. 2, 2012), accessed Dec. 5, 2013, http://goo.gl/r7zhst. 64 “Snyder Appoints Parker as Successor-Emergency Manager for Highland Park Schools” (Michigan Department of Treasury, May 10, 2012), accessed Dec. 5, 2013, http://goo.gl/c7Kfnx. 65 Joyce Parker, “Order 2012-1” (School District of the City of Highland Park, June 8, 2012), accessed Dec. 5, 2013, http://goo.gl/w2RhdP. 66 Dave Murray, “Emergency Manager Recommends Highland Park Become a Charter School District, as State Educators Fear Plan Will Spread to Others,” MLive.com, June 18, 2012, accessed Dec. 11, 2013, http://goo.gl/MNAaw. 67 Joyce Parker, “Order 2012-2” (School District of the City of Highland Park, June 18, 2012), accessed Dec. 5, 2013, http://goo.gl/Ek4gp8. 68 American Civil Liberties Union, “Highland Park Students File Class-Action ‘Right to Read’ Lawsuit” (Jul. 12, 2012), accessed Dec. 11, 2013, http://goo.gl/19gnBB. 69 “Highland Park Public Schools Selects Leona Group to Manage Charter System” (Michigan Radio, July 27, 2012), accessed Dec. 5, 2013, http://goo.gl/GUv3OL.